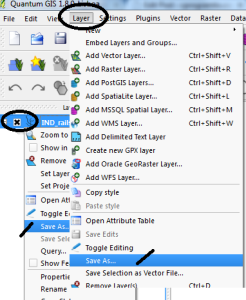 Convert Shapefile to kml by QGIS. Shapefile is ESRI based Vector file, While KML or Keyhole Markup Language is file which models and stores geographic features for display in Google Earth or Google maps. Many times you may require to convert the required shapefile to KML file, so that you can deploy the same over Google Earth for some reason. QGIS (Quantum GIS) is an open source GIS (Geographic Information System) tool, which let you upload the Shapefile and convert the same to KML file. Similarly ogr2ogr is also an open source tool, which let you to convert between GIS data formats. Look over shp to kml convert using ogr2ogr tool which can be marked as an alternative to this article. 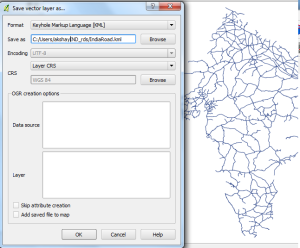 You can also see to convert Kml to Shapefile and also Shapefile to GeoJSON in QGIS. 2.) In the menu bar, select Layer and press Add Vector Layer. Now select the source type in the pop up window opened as File and browse the source Shapefile(Note:Your shapefile .shp, .dbf and .shx file should be in same folder). Press open. Select the coordinate reference type system if coordinate reference window appears and press ok. 4.) In the Save vector layer as window, Select the format from the drop down box as Keyhole Markup Language(KML) and browse the folder in which you want to save the KML file . Name it and Press OK. Your KML file will be Exported in the directed folder. You can Verify the generated KML file for its validity by uploading the generated KML file to QGIS or uploading KML file in Google map. You may soon find the tool and the coding for the same on this site. You may check in converting Geojson to Topojson and Shapefile to TopoJSON file. 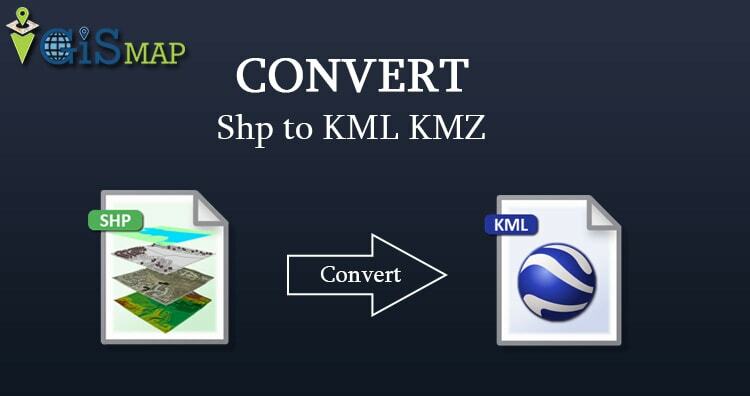 Hope this may help you in converting Shapefile to KML file easily. If you still find problem in converting the file, do let me know by commenting below. Is it possible to export to KML with a persol style added to the layer, for exemple, with colors according with population density, generated by QGis? It can be helpful to note that there are two fields in the exported KML file that can be used to store metadate e.g. names or numbers to enable the shapefile to be linked to other datasets these are Name and Description. This is useful for when you are creating KML files for use in tools such as Qlik Sense. 3. Update the DescriptionField and NameField boxes in the “Datasource Options” with the metadata field names. Thank you Rean for the information. However, it seems not to work if the type of one of those fields is numeric. I can manage to convert from shp to kml but some of the tribute table s missing. Why is it like this? and how can I simply convetr Shp to KML together with the atribute table. How to convert Point,Line,Polygon at time create a one kmz file. Thanks for such an interesting post you share with us. It’s really helpful for us. I am very thankful for you and your post.